Of course, there’s a long history of associating masculinity with meat, with poor families often reserving meat and other foods considered particularly nutritious for men, since they were believed to need it most in order to perform hard physical labor. Writing about the British working class during the late 1800s in his book Sweetness and Power, Sidney Mintz argues, “…wives and children were systematically undernourished because of a culturally conventionalized stress upon adequate food for the ‘breadwinner'” (p. 130). Men’s privileged access to meat actually spurred the consumption of sugar: “…while the laboring husband got the meat, the wife and children got the sucrose…” (p. 145). Sugar provided a relatively cheap source of calories for women and children’s diets to make up for the fact that they got less of other foods. Of course men also ate sugar, but historical evidence indicates that their diets were made up of more protein and less sugar compared to women and children. Sugar provided an energy boost and source of calories for women and children, but at the cost of providing little nutritional value. One (male) observer after another displays the curious expectation that women will like sweet things more than men; that they will employ sweet foods to achieve otherwise unattainable objectives; and that sweet things are, in both literal and figurative senses, more the domain of women than of men. (p 150). And of course this belief that women like sweet things more than men, and use them to “achieve” objectives (say, eating chocolate to soothe a broken heart after a breakup) is still with us today. 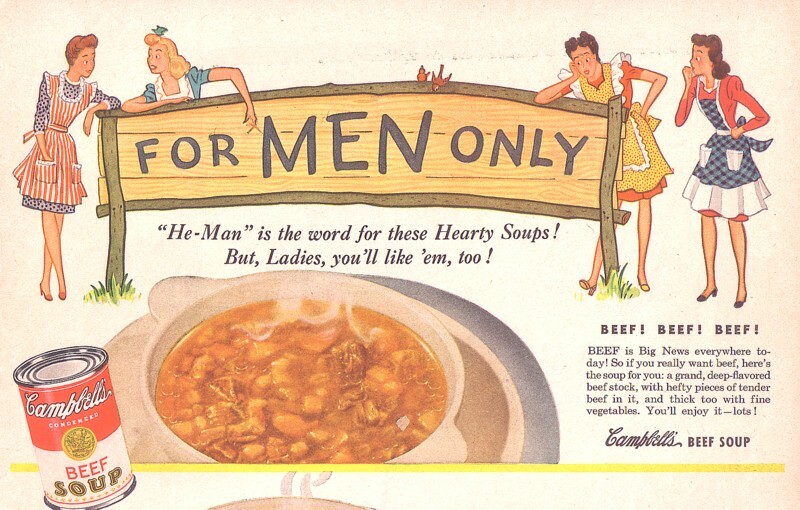 "Of course, there’s a long history of associating masculinity with meat,w ith poor families often reserving meat and other foods considered particularly nutritious for men, since they were believed to need it most in order to perform hard physical labor." Wow, I've never made this connection before. But it makes sense. Funny how it perpetuates the sugar n' spice=women stereotype. And just for the record, my boyfriend LOVES chocolate. A lot more than I do. And do you notice how one of the women on the left doesn't have legs? Ha - yes, although the leg-less woman was probably due to just carelessness. On the subject of masculinity and canned foods. I bought a can of Sloppy Joe sauce (basically sugar and tomato paste) and the can is labeled "MANWICH"
I've stopped buying it not only because I can make my own that tastes better and DOES NOT contain high fructose corn syrup, but also because it's annoying to buy a food that's supposedly for men when, well, I'm a woman (who's loved sloppy joes since childhood, how dare they!?). And on the few occasions chocolate is now marketed to men for their own consumption (at least in the west) they desperately try to 'masculinize' it - the Yorkie bar 'It's NOT FOR GIRLS!' campaign, anyone? In Japan, sweets are considered very feminine and I was told that some men avoid eating them in public or displaying an affinity for sweets and candy. I wonder if they had the same history of reserving protein sources for the "breadwinner" of the family? I don't understand the line about how it was "believed" that physical laborers need things like protein. Is this something that has been debunked? Re: the line about physical labourers needing protein. I don't think Gwen is saying that labouring men didn't need protein, but she is questioning the belief that they needed it more than children (who were growing) and women (who were for a significant amount of their lives "producing" and nourishing children with their breast milk). And on that note, I'm not sure if pregnant and breastfeeding women were also given preference in the allocation of meat in the 1800s. Does anyone know? One place where it is especially easy to see sugar and sweetness being equated with the femininity is in alcoholic drinks. I certainly remember thinking beer was for men only when I was very little (because my father and his friends drank it). Beer or hard liquor is a "man's drink" while anything remotely sweet (cosmopolitans, daiquiris) is immediately considered feminine and therefore, "sissy." Men are pressured not to like these drinks lest they be deemed weak. That's really interesting. My husband hates the idea that women love chocolate more than men - he does not like the idea of downplaying his chocoholism, or the implication that it is unmanly! Interesting to finally know where this kind of thing started - although I'm sure the poor families couldn't afford chocolate specifically. Weighing in a bit late (all right, a lot late): the bit about men needing protein reminds me of the scene in Germinal where Maheu's wife somehow manages to get hold of an entire half-pound of tripe. So what does she do with it? She cooks it for her husband. And carefully instructs her younger children (the only ones who know about it) to lie to their father and tell him they've already eaten some. See, Maheu is the one who needs Meat, because he's The Man Of The House. He works hard all day long in a coal mine. Of course, so do his twenty-year-old son, his fifteen-year-old daughter, his twelve-year-old son, and his father ... but The Man Of the House needs Meat.